My partner's stepfather is seriously ill and the prognosis doesn't look great. I want to send flowers to his mother and stepfather. I don't want to be intrusive, but I do want to help them in any way I can. I have experienced great suffering and I know what it's like firsthand to go through a parent's serious illness. His mother is a French woman from French Brittany, which is why I'm writing in French. I also need to send this through a courier and want to be privée. I have not met his parents yet. They likely do not know I exist, and my partner is a very private person. I want to keep our relationship ambiguous to his mother; they can talk about it themselves. We are young, if that contextualizes it. Just out of college. His parents are too young for this to be happening. The father is still alive at this time and I am not supposed to know it's this bad. I have inferred this based on context. This is what I came up with, after etiquette checking with a linguist colleague. I was wondering if you all could help further. I don't want to offend or impose more stress on the family in this time. Je m'appelle XYZ. Je suis la copine de votre fils DEF. Je suis désolée d'entendre que Mssr. ABC est tombé malade. J'espère qu'il retrouver la sante bientôt. Si je peux vous aider de n'importe quoi façon, j'en suis pret. Je suis ravie de le faire. J'ai achété ces fleurs pour vous et Mssr. ABC. Je sais que vous avez trop de choses en tête en ce moment. Je suis à votre service. 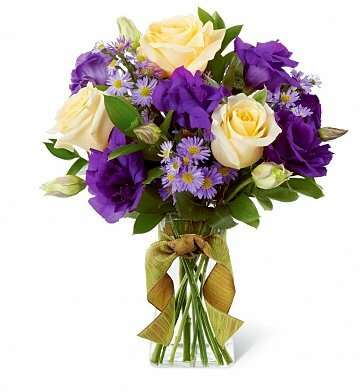 Roses, lisianthus and asters in a modern, sophisticated display. ...in case anyone knows about les fleurs appropriate for a French family in this time. Je m'appelle XYZ et je suis la petite amie'copine' is a bit familiar, you say that when you talk about your new girlfriend to your friends. In this case I'd prefer used 'petite amie' which is more neutral and suitable de votre fils DEF. Je suis désolée d'apprendre que votre conjoint replace 'conjoint' by 'mari' if they are married est tombé malade. J'espère qu'il va se rétablir le plus rapidement possible. Sachez que je suis disponible pour vous aider de n'importe quelle façon que ce soit. I delete J'ai achété ces fleurs pour vous et Mssr because it's obvious ! Note that copine or petite amie is not ambiguous. It's clear that your have a relation together, even new. And for opinion on flowers, I don't have the required knowledges but a florist can easily advise you. Not the answer you're looking for? Browse other questions tagged grammaire traduction expressions usage choix-de-mot or ask your own question.